The compact dependability of the Nite Sport series has been supercharged!!!! 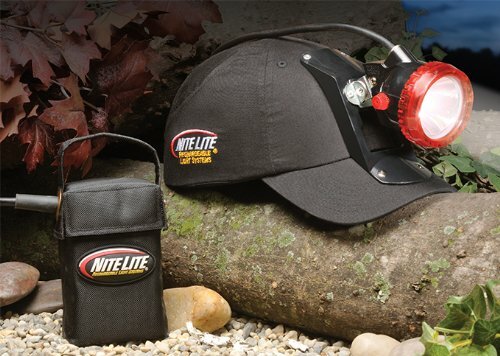 Nite Lite has supercharged the Nite Sport 2 with powerful LED technology. LEDs offer twice the brightness of comparable incandescent bulbs and use half the power. The Nite Sport LED comes with two brightness settings. You get 20 hours of run time on high, and up to 60 hours on low. Whe the charges does run low, the lamp will issue a strobe signal, so you'll know it's time to head back to the truck. Includes the new Lo-Pro soft twill cap with protective insert and hand-hold soft battery pack. The convenient belt loop also offers use as a walking lamp. Includes compact wall charger. Optional car charger is available to power up your battery on the drive. If you have any questions about this product by Nite Lite, contact us by completing and submitting the form below. If you are looking for a specif part number, please include it with your message.